Home Blogging tips Is Twitter a good marketing tool? Is Twitter a good marketing tool? 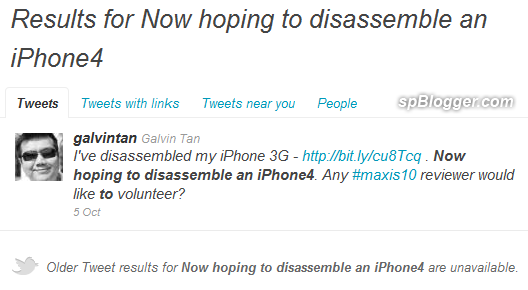 Based on my experience on Maxis10 iPhone 4 review, Twitter is good on live event or short term marketing with hashtags. For example, Maxis10 hashtag to show all the tweets about Maxis10. However, it can only display up to 1 week tweets that contain Maxis10 hashtag. No more older than 1 week tweets (today is 13 October 2010). Same apply to normal Twitter search. It can only return result up to 1 week only (as it is using the same search method on hashtag). Therefore, older than 1 week tweet cannot be found. Again, this is good for short term marketing only. As a conclusion, if you plan to have long term marketing on your products, better put money on those search engine optimised blogs like JayceOoi.com. Normally, people will use Google to find and not Twitter, right? Previous articleVibrant vs Infolinks vs Kontera ~ Which in-text ad is better? Next articleHow to fix phpBB fails to upload large size file?